The UK edition of Cataveiro, second volume in The Osiris Project trilogy, was released this week from Del Rey UK in trade paperback and ebook. Del Rey have done a truly beautiful job with the cover and I’m delighted to see the book out in the world. For political exile Taeo Ybanez, this could be his ticket home. Relations between the Antarcticans and the Patagonians are worse than ever, and to be caught on the wrong side could prove deadly. For pilot and cartographer Ramona Callejas, the presence of the mysterious stranger is one more thing in the way of her saving her mother from a deadly disease. I’ll be blogging and guest posting more about the book over the next month or so, and Del Rey will be hosting an extract which I’ll link to once it’s up. 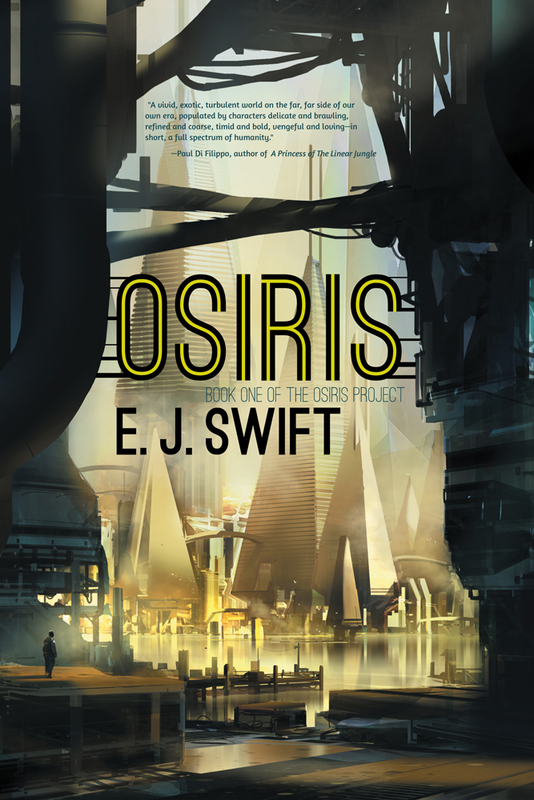 This entry was posted in Books, Cataveiro, Del Rey UK, Osiris Project on February 22, 2014 by E J Swift. Ends/beginnings of years inevitably call for round-ups, and 2013 has been an eventful one. On the writing front, I was thrilled to see the UK debut of Osiris with Del Rey UK in its trade, audio, and paperback forms, and the Osiris US paperback released in August with Night Shade Books, now part of Skyhorse Publishing. I finished work on the second in The Osiris Project trilogy, Cataveiro (pronounced ca-ta-veh-ro), which is scheduled for publication in February 2014, UK trade paperback, and July 2014, US hardback. I also had a short story, Saga’s Children, in the solar-system themed Pandemonium anthology The Lowest Heaven, and saw The Complex reprinted in Best British Fantasy 2013. I’m now working on the third novel in The Osiris Project and this will be the focus for the first half of 2014. After that – well, plans are in the works. For the last few years I’ve kept a record of books read, and after some slightly disconcerting analysis of my own reading habits I made a decision that from last year I would read an equal ratio of male and female authors. A lot of the writers that I came to love at university, when I had more time to read than I probably ever will again, were male – looking back, and thinking about the bias of the course curricula, this is no real surprise. So this year I’ve split my reading 50-50. In total I read 26 novels, 13 male and 13 female authors, plus a few anthologies. As part of my research for Cataveiro I discovered some superb Spanish and Portuguese-speaking authors, and would particularly recommend Angélica Gorodischer’s Kalpa Imperial, Roberto Bolaño’s Last Evenings On Earth, Chico Buarque’s Budapest, and Bernardo Carvalho’s Nine Nights. I started but haven’t yet finished Lygia Fagundes Telles’ The Girl In The Photograph. I found recommendations for several other female writers I would have liked to read but alas, couldn’t find a translation. Meanwhile, Bolaño’s epic 2666 is still on the shelf, awaiting its moment. I’m usually a year behind with new releases as I tend to wait for the paperback (hardbacks are beautiful but I can’t bear to see them get messed up on the tube, and although I love my Kindle, as a writer there is no substitute for a library you can flick through) so I caught up on a number of older releases. I read a lot of brilliant fragmented novels this year: Hawthorn and Child by Keith Ridgeway, Tokyo Cancelled by Rana Dasgupta, Communion Town by Sam Thompson, The Race by Nina Allan. I’d thoroughly recommend the beautiful and haunting All The Birds Singing by Evie Wyld, and was delighted to find Jennifer Egan’s Look At Me to be just as clever, funny and touching as one of my favourite novels of recent years, A Visit from the Goon Squad. My last read of 2013, What Lot’s Wife Saw by Ioanna Bourazopoulou is a clever, intriguing conundrum of a novel. Going to be spoiled for choice for reading in 2014: I want to catch up on novels by Aminatta Forna (The Hired Man), Chimamanda Ngozi Adichie (Americanah), Eleanor Catton (The Luminaries or The Rehearsal), and Kate Atkinson (Life After Life), just for a start, and of course, a new David Mitchell novel, The Bone Clocks, out in September. This entry was posted in Books, Cataveiro, Osiris, Osiris Project, Recommendations on January 9, 2014 by E J Swift.